After capturing a perfect photo whether to commemorate special events, or random selfies to share on your social networks, or use it for anything else, only for you to have it ruined (or photobombed) by a not so perfect background. Bet this happens sometimes, you will feel so disgusted. Well, there’s still hope for you. Now, if you have a professional grade image editing software (read: Photoshop), it’s quite easy to eliminate background from images. But not everyone wants to shell out cash for (and learn using) a full-blown image editor application, for something as simple as the occasional background removal. Thing is, you don’t have to, as there are many online tools (and even mobile apps) that can help you do the same, the easy way. Sounds like something you can use? Read on to find out how you can remove background from images without Photoshop. 1. Open the Remove.bg website and tap on the “Select a photo” button. You can choose to instantly click a photo, select one from the background or enter an image’s URL on the homepage to erase its background. 2. Once you click on the “Take Photo” button, it will open the camera app to let you capture an image. 4. Within a matter of a few seconds, you’ll get a new version of your image with a white background that you can download by tapping the “Download” button. Note: You need to create a free account to download the images edited with Background Burner. Doing so also saves all the processed images to your account (unless you delete them manually). 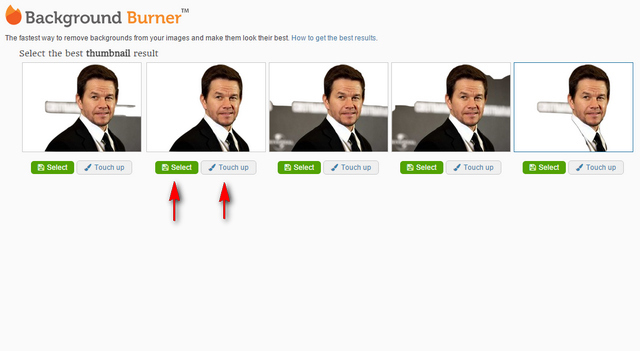 Step 1: Head over to Background Burner’s website, and upload (or drag-n-drop) the photo to be edited. Step 2: Wait a little as Background Burner starts working on the photo, removing the background in real-time. Once finished, it outputs multiple copies of the processed image, and you can select the best looking one to be saved (in PNG/JPG formats). You can even add one of the many available backgrounds (or use your own) to the processed image. (Optional) Step 3: If there are some parts of the background still left in the image that you’d like to manually remove, you can do so via the “Touch up” button. This loads up the equally easy to use online editor. Just define the part of the image to be retained with the foreground tool, and the part to be removed with the background tool, and the changes will be made in real-time. Now that’s pretty amazing, if I say so myself. And if you want more functionality (such as automated batch processing), you can use the professional version of Background Burner, geared more towards businesses and eCommerce merchants. The paid plans start from $9.95 per month (Find out more here). Quite a lot of our images end up being useless and worthless, all due to unwanted backgrounds. However, as seen above, the above shows that there are online tools out there for you to get rid your favorite photos of those nasty photobombs without using Photoshop. So try the above, and share your thoughts about them in the comments below.